At one time, multi-starrers were in vogue but of late, such films barely come out of Bollywood. A few franchises like GOLMAAL and HOUSEFULL have kept this tradition alive. Even DHAMAAL can be counted here and its recent instalment TOTAL DHAMAAL was one of the biggest multi-starrers in a long time as Ajay Devgn, Anil Kapoor and Madhuri Dixit got added to the star cast. 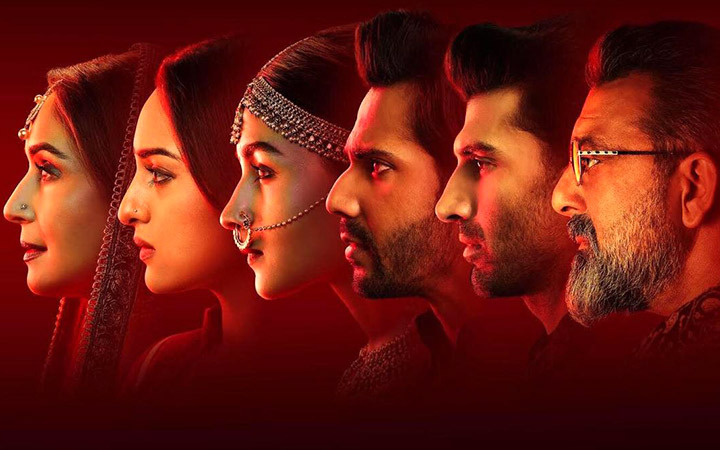 KALANK goes one step ahead as it stars six actors, all of whom are big and prominent names in their own right. 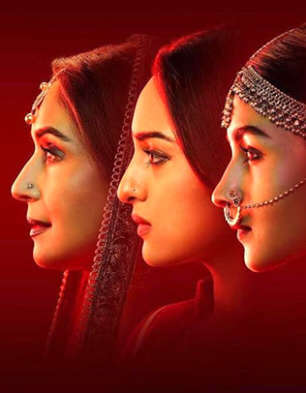 So does KALANK manage to be a memorable multi-actor flick, replete with ample entertainment and drama? Or does it fail to entertain? Let’s analyse. KALANK is the story of lovers not destined to be together. The year is 1945. Satya Chaudhry (Sonakshi Sinha), wife of Dev Chaudhry (Aditya Roy Kapur) is diagnosed with cancer and she is told that she has just a year or maximum two years to live. Realizing that Dev will be shattered after her demise, she decides to find a second wife for him. Her search takes her to Rajputana, Rajasthan where Roop (Alia Bhatt) resides. The families of Roop and Satya go back a long way. Roop at first rejects Satya’s offer but upon knowing her medical condition, she agrees. However, she has a condition – Dev will have to marry her first and only then she’ll move into the house of the Chaudhrys. Satya, Dev and Dev’s father Balraj (Sanjay Dutt) agree. Dev and Roop get married and the former makes it clear to the latter that this will be a marriage of convenience. After marriage, Roop moves to Husnabad near Lahore where the Chaudharys reside. At first she feels lonely but then gets curious by the voice of Bahaar Begum (Madhuri Dixit). She decides to learn music under her tutelage. Satya and others at first are aghast on hearing this decision since Bahaar runs a brothel and that too in the infamous part of the city called Heera Mandi. Roop protests and the Chaudharys give in. Bahaar meanwhile is impressed by Roop and decides to teach her singing. At Heera Mandi, Roop bumps into the flirtatious Zafar (Varun Dhawan). Both get attracted to each other. Zafar is a blacksmith and works for Abdul (Kunal Kemmu) and the latter has a communal mindset. He’s also against Dev’s newspaper Daily Times that promotes the idea of one nation theory, rejects the notion of Partition and recommends industrialization even at the cost of job loss of blacksmiths. Bahaar senses that Roop is getting attracted to Zafar and she gets horrified. After all, she knows that Zafar has ulterior motives behind romancing Roop and it get can lead to disastrous consequences. What happens next forms the rest of the film. Shibani Bathija's story is poor and silly and rests on a wafer thin plot. Except for Roop-Zafar’s track, all other parts of the story are not well fleshed out and are full of loopholes. Abhishek Varman's screenplay doesn’t do much to salvage the situation either. Instead of wrapping up scenes quickly, he lets them go on and on. And again, he doesn’t do much to hide the glitches. Hussain Dalal's dialogues are quite good at places. But in some scenes, it’s too filmy and might even induce unintentional laughter. Abhishek Varman's direction is not upto the mark. He was quite in control in his directorial debut, 2 STATES . But in the case of KALANK, he makes a mess. Anyways he couldn’t have done much when the script itself is flawed. The only plusses are that the climax is engaging and he is able to handle the visual grandeur of the film very well. KALANK has a surprising commencement since the trademark and famous title card of Dharma Productions is not displayed in its usual style! The three production houses associated with the film are quickly mentioned and the film begins. Again, here the principle cast is depicted quite smartly, without showing their faces. This might make everyone believe that one is about to see a film laced with a superlative script and execution. In no time, it becomes evident that it’s not going to be the case. The biggest problem with the film is that most of the developments are not convincing. In the beginning itself, audience will be bewildered as to why Satya went to Rajputana of all places to search for a bride. Roop reminds Satya that the latter’s family had helped the former’s family at one point but no details are ever given. It is also quite laughable that Zafar had never seen the face of Dev Chaudhary ever despite the fact that he had so much poison against the Chaudharys and also that Dev is a prominent figure of the town. The entire track of the blacksmiths revolting against industrialization and also for a separate nation also seems superficial. Why was Abdul so insecure about what gets published in Dev’s newspaper? Agreed that Dev’s daily must be having a wide readership. But it can’t be the only newspaper in circulation? He could have taken the help of other newspapers to spread his agenda. The film moreover is too long and some scenes could have been done away with. The bull fight sequence, for instance, serves no purpose and was just added to appeal to the masses. On the positive side, a few sequences are well directed. The intermission point, though predictable, makes for a nice watch. The sequence of Bahaar Begum, Balraj and Zafar in the second half is quite dramatic. Also, the climax and the madness at the railway station will keep the viewers engrossed. Varun Dhawan and Alia Bhatt save the film from becoming an ultimate disaster. Varun is as always at his best and gives his hundred per cent to the role. He also contributes to the laughter quotient. In the climax however, he is terrific. Alia Bhatt also puts her best foot forward and just like Varun, even she is let down by the poor writing. She arguably has the maximum screen time out of all six actors and makes great use of it. Aditya Roy Kapur seems monotonous but this is how his character is. His dialogue delivery is quite good and in the scene with Varun, he does quite well. Sonakshi Sinha is sincere but her role will remind one of her act in the second half of LOOTERA . Madhuri Dixit looks stunning and gives a decent performance. Sanjay Dutt, credited as special appearance, is okay. Kunal Kemmu (Abdul) plays the villainous role with panache. Achint Kaur (Saroj), Hiten Tejwani (Ahmed) and Pavail Gulati (Aditya; journalist interviewing Roop) are fine. Kiara Advani is royally wasted. Kriti Sanon looks glamorous in the item song. Pritam's music could have been much better. 'Ghar More Pardesiya' leaves impact followed by 'Tabaah Ho Gaye'. The title track is relegated to the background. 'First Class' is catchy and 'Rajvaadi Odhni' is okay, but they come almost back to back. 'Aira Gaira' is forcefully added. Sanchit Balhara and Ankit Balhara's background score is dramatic and adds to the effect. Binod Pradhan's cinematography is captivating and has the big screen appeal. Amrita Mahal Nakai's production design is surreal and though it might remind one of Sanjay Leela Bhansali films, it is praiseworthy. The Heera Mandi set and especially the brothel of Bahaar is stunning. Manish Malhotra and Maxima Basu Golani's costumes are appealing but doesn’t seem authentic in terms of the era and the economic condition of some characters. Sham Kaushal's action is fine and not too violent. Remo Dsouza, Bosco-Caesar and Saroj Khan's choreography is worthy. Fluiidmask Studios and NY VFXWaala's VFX is good overall but quite bad at certain places, especially in the bull fight sequence. Shweta Venkat Mathew's editing is very disappointing as the film is quite lengthy at 168 minutes. On the whole, KALANK is a visual spectacle that lacks soul and falters big time on account of its writing, length as well as music. At the box office, the film will suffer due to negative word of mouth and therefore the collections will drop after the initial euphoria subsides. DISAPPOINTING!